Today, the lovely Marianne of Haven and Home will be sharing her beautiful “Dream Home” with us. 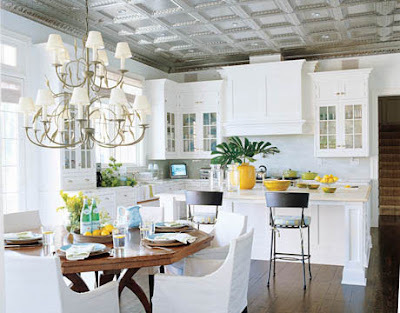 To me, this is the essence of true Southern style with a modern twist. Beautiful job, Marianne! Hi La Dolce Vita Readers! It is great to be back here! Wow, my dream house....I could do this exercise 12 times and get 12 different versions. I believe that comes with the job description Interior Decorator but here is one version I came up with. 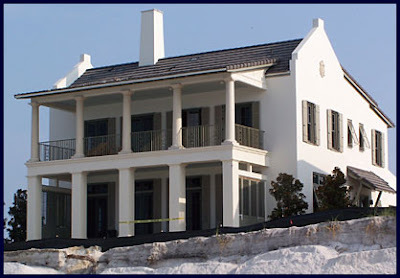 I have to laugh that I started with a picture of a house that is under construction but it shows so many elements I love-white exterior, contrast trim, double porches and shutters. 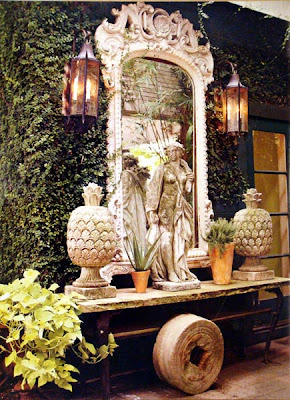 Once the house was finished I would make sure the exterior had welcoming touches as well as unexpected details like this outdoor setup... Once inside the house I would like the entry to be bright and cheerful. I love that this room looks put together yet the curtains and ceiling add a bit of playfulness. There are so many living rooms out there that would suit me just fine but I chose this one because it is unexpected. 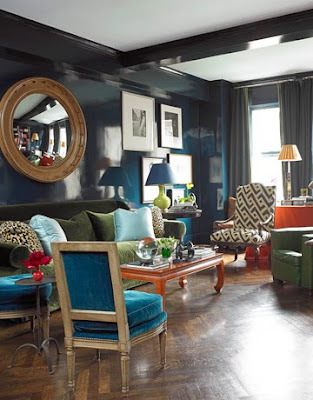 The lacquer walls add interest along with the colorful furniture and accessories. I would add a rug for some softness although with floors that pretty it may be a crime. Oh the kitchen, the heart and soul of the house. We love to entertain and dream of the day when we will be able to do so in a spacious kitchen. Ceiling tile? Check. Marble counter tops? Check. Large Island? Check. Eating area with fabulous light? Check. The only thing I would change is either the island color or I would paint the lower cabinets a darker color. Next would be the dining room which I would like to have a formal yet unstuffy feel. I am also a big believer in large round table when they fit (which is rare). When it is time to retreat it is off to the bedrooms. My dream master bedroom would have a beautiful, preferably antique upholstered bed, full rich curtains, a plush rug, ample seating, a statement making light and definitely symmetry. I don't believe in symmetry everywhere but I do really like it in bedrooms. What would a dream master bedroom be without a great bathroom to go along with it? 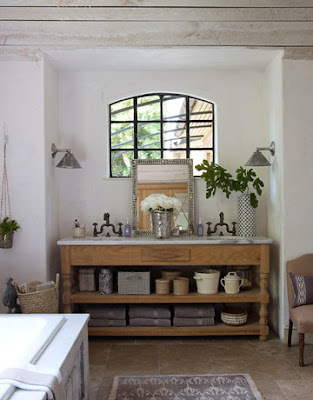 I chose this bathroom because I love the dark trim on the windows, the natural elements, the amazing natural light and the general laid back feel that comes with it. For guests I would definitely want to keep the light and airy feel going. I want company to feel like they are on vacation and their room is a retreat that brings peace and quiet. 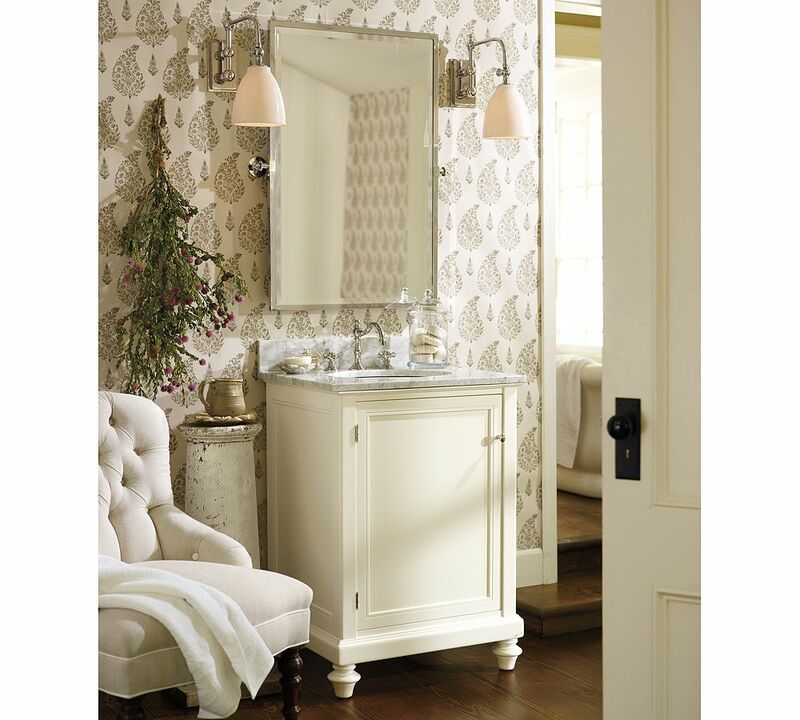 A peaceful yet interesting bathroom to go with the guest bedroom would look something like this. Simple in theory, but with added details like a great wallpaper and even an upholstered chair. One more room I wanted to throw in was this boys room. We are expecting a boy in August and really when it comes to a room for little men this one is just about perfect. 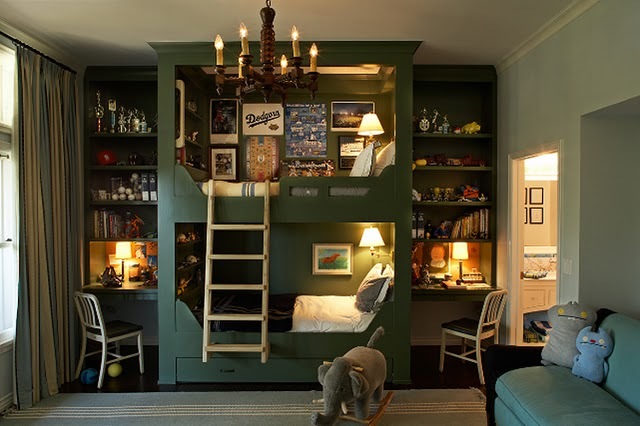 The color, the storage, lighting inside the bunk beds, the light in room-it all feels youthful but special at the same time. Thank you Paloma for having join in this guest series! Just beautiful. This could be my dream home too. Oh, I love Marianne' style and I love her! Isn't she a very sweet and talented person? I'm loving her "dream home". Every space is so special and so pretty. You know sometimes its the unexpected rooms that can make the most impact when styled...that laundry room had me flipping out! The color of that wood and just how clean it looked....love it and the kitchen! That boy's room would be the best on the block! Love Marianne and her blog! 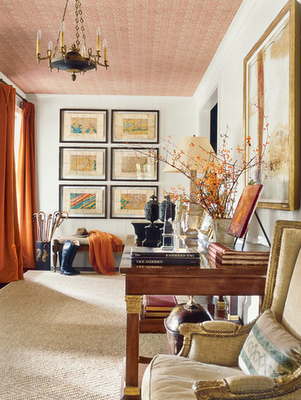 I love the blue and orange entryway, the laundry room, the formal dining room and the boy's room! Lovely picks! *** Have seen (& even made my screen-saver!) that creamy, bright dining room before... ohhhh, how I LOVE the way it makes me FEEL!!! GOOOOOD choices to share today! Beautiful dream home! I adore the guest bedroom, it is very sophisticated. I love the house and the playful way to put it together room by room with some inspirational photos. The room I am most in love with funny enough is the laundry room Ha! 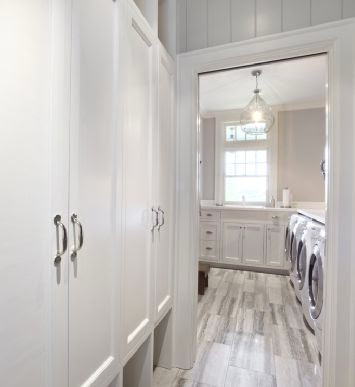 I love a nice laundry room, you know the kind that makes you actually want to be in there? Very nice and light. Thanks for the inspiring photos. The laundry room is just what I have always dreamed of having in my house. With 5 children I need more than the small laundry room I am currently using.